ATV - UTV Parts (4 Wheeler). Boat Inboard I/O Engine Parts. Jetboat & BWC Watercraft Parts. Paint & Accessories & Tools. Sports & Recreation & Clothing. NIB Force 85-90-120-125-150HP Water Pump Kit w/Housing FK1204-1 Outboard. This item is new and recently ordered. 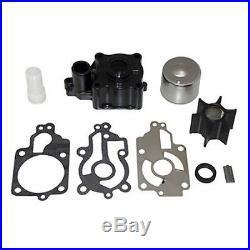 Description: Water Pump Kit w/Housing. Fits: Force 85-90-120-125-150HP 1990 & Up. (Bottom left: "ask a question" link). We will answer questions in a matter of minutes.......... We do have 1000s of NEW and USED parts for Outboards, I/O, Inboards such a Johnson, Evinrude, Yamaha, Honda, Forte, Suzuki, Mercury.... PAYMENTS: We accept Pay Pal. Those 3 categories do not offer tracking or cannot be traced. We have never lost a package, but some customers get anxious not knowing where is the package or when it will arrive. If you do not choose a service with tracking information and the package get lost or delay is your responsibility. (below the price of the item). (2) Custom or special order items. (4) Liquid like maintenance products. (6) Items with missing parts. We sell new and used parts. We are increasing our offering catalog to help our clients to have a One Stop Shop! Questions: All item questions MUST be submitted through Ask a Question (blue color small) at the bottom left corner of this page. The item "NIB Force 85-90-120-125-150HP Water Pump Kit withHousing FK1204-1 Outboard" is in sale since Wednesday, August 05, 2015. This item is in the category "eBay Motors\Parts & Accessories\Boat Parts\Outboard Engines & Components\Lower Unit Components". The seller is "landmarinetoyscom" and is located in Hollywood, Florida. This item can be shipped worldwide.